The Taser X26 electronic weapon at the Taser International Inc. manufacturing facility in Scottsdale, Ariz., Wed. April 22, 2015. The maker of Tasers says at least 15 people caught fire and five died after being shocked near flammable materials. 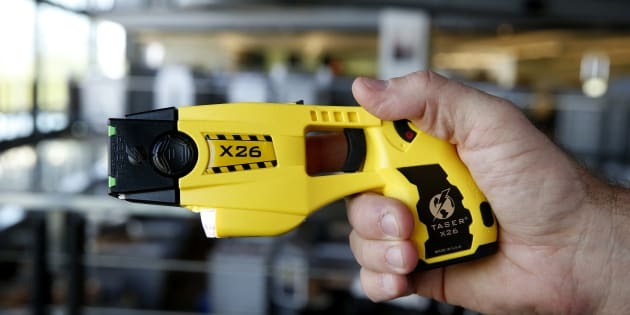 OKLAHOMA CITY — The maker of Tasers says at least 15 people caught fire and five died after being shocked near flammable materials, similar to a man in Oklahoma who was stunned, then went into his gasoline-soaked van. A spokesman for Arizona-based Axon said Monday that the deaths include the man shocked Nov. 7, although authorities are still investigating whether the Taser or a cigarette lighter that police say the man was carrying caused the fire. McClain County Sheriff's Det. David Tompkins said it appears the officer was justified in using the Taser, despite the fire risk. The man was burned beyond recognition after catching fire near Lindsay, about 45 miles (72 kilometres) south of Oklahoma City. Tuttle said the device has been used more than 3.5 million times in the past 24 years.